Donatos knows the best way to run a pizza business, because we do it ourselves. We have 55+ years of perfect pizzamaking behind us. And a very bright future ahead of us thanks to our Franchise Partners and associates who have embraced our business model, processes, and belief that every piece is important. You’ll see that Donatos is the right business for you. You could say that we’re more than a little bit fanatical about providing a consistently delicious product every time: It’s embodied by our motto: Same Pizza, Anytime, Anywhere. For our Franchise Partners, that dedication has led us to develop systems that take the guesswork out of running your franchise. Our proprietary Famous Thin, thick, and hand tossed pizza crusts are made at the home office bakery and shipped to your location. This is to ensure a consistent product from location to location and from pizza to pizza. To reach peak pizza perfection, we developed a formula that explicitly spells out how much to use of each ingredient by weight and specific bake times. This allows our restaurants to focus on pizza production, reducing food costs, and delivering great customer service. Our Menu Innovation Team has extensive experience and constantly tests new menu options to ensure that our offerings are on-trend and keep customers coming back for more. Meet our team behind this innovation. Cynthia studies competitive data and customer feedback to ensure we deliver on flavor and demand. She leads the charge on executing changes to existing menu ingredients and new product roll-outs. With a background as impressive as her palate, she’s worked for brands such as Thornton’s, Wendy’s, ConAgra Foods, and Hardee’s. By watching trends, Lenae keeps us current on food trends and spearheads production technological advancements. Prior to joining the team, she built up impressive experience as a chef, sous chef, kitchen manager, catering and purchasing manager and overall restaurant Renaissance woman. Patty brings a wealth of knowledge to the Menu Innovation team with over 35 years of foodservice experience in operations, research & development, and quality assurance. She is also a Registered Dietitian and ensures compliance to FDA/USDA regulations related to nutrition and products. There are eight key ingredients that make our pizzas stand out from the competition and ramp up the crave factor for our brand fans and newbies alike. 1 Thin crust pizza that’s party cut, so there’s more to go around! 2 We put 100 pieces of heritage pepperoni on every large thin crust pepperoni pizza. 3 Our pizzas are loaded Edge to Edge® with toppings so your pizza is consistent, and there’s no more fighting over the best piece. 4 No artificial flavors or colors in our pizzas, subs, or salads. 5 We use real Wisconsin aged smoked Provolone cheese because it’s more flavorful. 6 We take pride in our dough: it is baked to golden perfection and finished with a sprinkle of cornmeal for extra crispness. 7 The chicken in our pizzas, subs, and entrée salads is sliced natural white meat. 8 We slice our fresh Roma tomatoes, onions, and green peppers each day for our pizzas, subs, and salads. 5 POINTS OF DISTRIBUTION. 5 WAYS TO BOOST YOUR BOTTOMLINE. 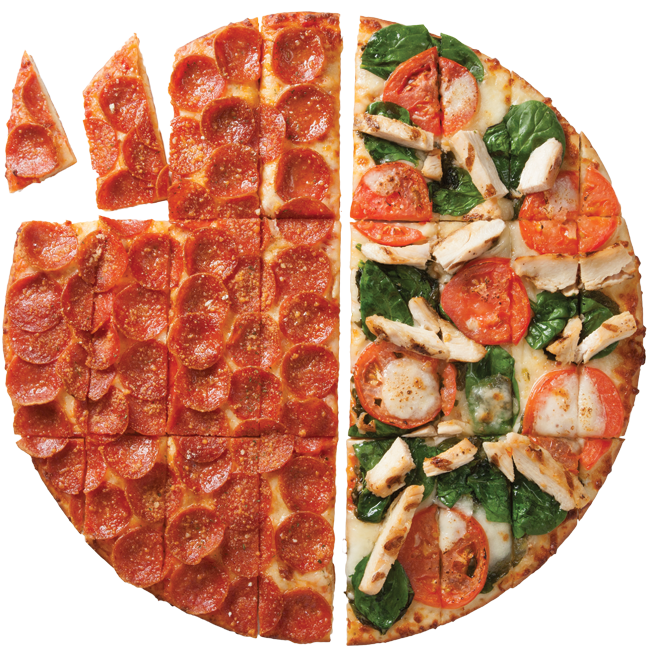 Together, this combination drives your bottom line better than other fast-casual pizza restaurants. Ongoing Training and Support and a TeaM BehinD You. The training programs and expertise we use to educate over 1,900 company associates who operate high-performing restaurants is available to you and your staff. This includes custom-designed curricula for Franchise Partners and your management staff. We also provide an ongoing, online training curriculum for your associates. 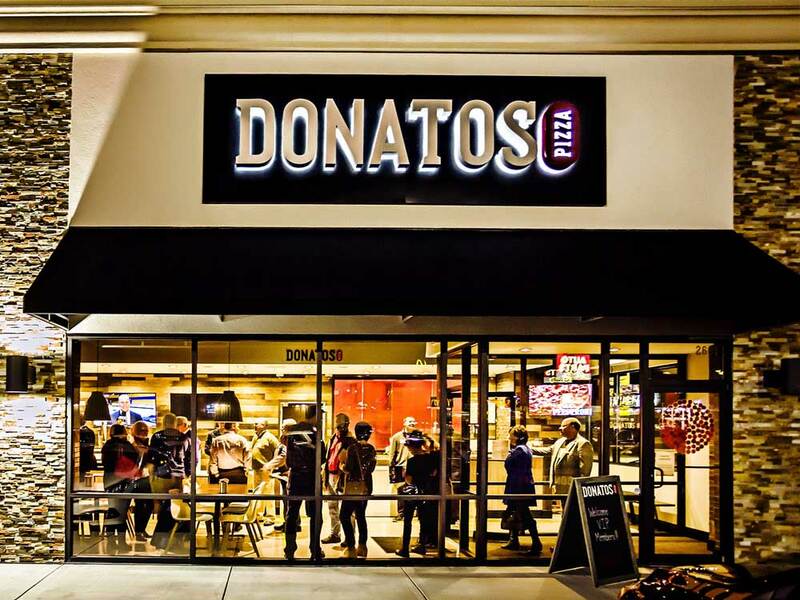 With double-digital sales growth since 2013 and a 2017 Average Unit Sales Volume of $1,059,257*, Donatos restaurants out-perform the average pizza restaurant by 183%**. Our sales, fueled by our tremendous average check, make Donatos a rewarding franchise opportunity.